If you are looking for a high quality fishing reel that will be turned to often for years to come, then you should definitely stop and check out the PENN Spinfisher V Spinning Reel! This attractive fishing reel can hold up to even the toughest use, and is available in a variety of different sizes that will allow you to choose the reel that is right for the way that you fish! Definitely a popular reel from a brand PENN, a reputable brand that you can easily trust to be on your side when it comes to choosing quality fishing gear, this fishing reel can hold up to tough environmental conditions, and even tougher fishing! The first thing that you will notice about the PENN Spinfisher V Spinning Reel is that it comes in a variety of sizes, including 0, 3500, 4500, 4500LL, 6500, 6500LL, 7500, 8500, 8500LL, 9500, and 10500. The different sizes should be noted, as each will support a higher weight when catching fish, and can be used for a variety of different fishing types. For example, if you are looking to catch large, heavy bass, you might choose a size such as the 7500, as opposed to catching smaller fish, such as a Sunfish, which might only require a size 3500. These size differences can make all the difference when you are selecting which reel to choose for your fishing expedition! This fishing reel features a highly durable construction that allows you to spend plenty of time fishing and less time worrying about whether or not your gear is going to hold up. The body of the fishing reel, which is a metallic gold in color and quite appealing on the eyes, is made fully from a high quality metal, meaning it will hold up to frequent use. The quality metal body construction of this reel allows the reel to have an easier time staying aligned and working well when faced with larger loads – it definitely can withstand larger fish with ease! The reel is also has a watertight design that helps to keep water outside of the reel instead of allowing it to leak inside, which ends up shortening the life of your fishing reel. The fishing reel also features a Techno balanced rotor. The smaller size choices of the PENN Spinfisher V Spinning Reel feature enhanced gear ratios, as well. The machined and anodized aluminum Superline spool has line capacity rings which will give you a guide as to how much line you can store on your spool in order to keep your fishing reel in perfect working order. The PENN Spinfisher V Spinning Reel is also salt water resistant, allowing you to take your fishing reel wherever the adventure awaits, whether that be in a freshwater lake or on a boat in the middle of the sea! 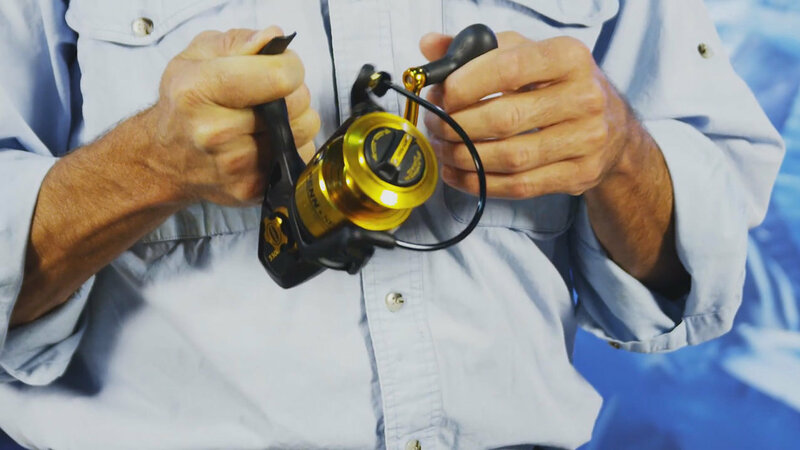 With a high quality fishing reel such as this, there are an abundance of features that will make it a quick favorite! From the durable construction to the increased accuracy with each cast, it is easy to see why this reel is so popular. Another added feature that has been added in recent upgrades is the instant anti-reverse feature that allows you to prevent yourself from accidentally reversing the line after you cast out. This decreases line breakage and keeps your fishing reel working like new. The PENN Spinfisher V Spinning Reel is a favorite fishing reel among those who are new to the exciting world as fishing, as well as those experienced pros who are looking for something high quality to last them a long time. With durable construction and the ability to choose a larger size to help you catch some big fish, this fishing reel is perfect for your favorite fishing rod, and can go pretty much anywhere you desire! The watertight design of the reel is a customer favorite feature, as is the salt-water resistance that it carries with it. The PENN Spinfisher V Spinning Reel is a great fishing reel from a brand name that you can trust.